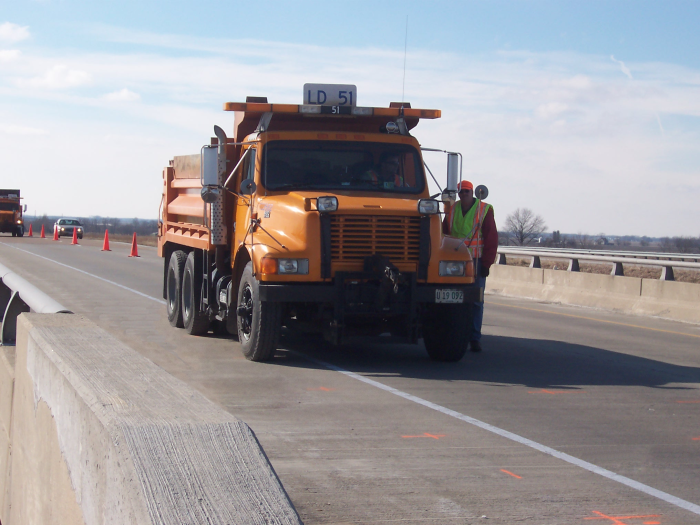 The Illinois Department of Transportation ran tests on twelve interstate highway bridges in Illinois along Interstates 55 and 70/270 to validate methods for calculating bearing forces. The department selected typical Illinois interstate highway bridges that allowed a good range of study parameters. These bridges were instrumented on their beam webs with strain-gage rosettes to measure shear stresses caused by loads. Test data were collected by Campbell Scientific dataloggers for approximately six months at each bridge to determine loading trends. At most of the test points, the researchers installed three triaxial strain rosettes in a vertical line on one side of the web, and also on the opposite web face on selected beams to determine the effect of torsion. For gage installation on concrete beams, individual strain gages were arranged in a three-element triaxial pattern at each rosette location. Campbell Scientific CR5000 dataloggers were chosen for their programming, signal conditioning, remote monitoring, and reporting capabilities. Multiple CR5000 units were used for initial load tests at each bridge site since strain gages were mounted on all beams to aid calibration. Following the initial phase, one datalogger was required at each bridge site for the long-term testing. The datalogger program was developed by Southern Illinois University Edwardsville (SIUE) using the CRBasic programming language and runtime compiler included with the CR5000. SIUE wrote in features such as continuous strain-gage monitoring, computation of beam shears, periodic strain-gage zeroing, and data storage. The dataloggers’ batteries were recharged by 75-W solar panels mounted to the side of the abutment. For the initial load testing, the data were downloaded to laptop computers immediately to verify all gages were performing and to make adjustments. Long-term data acquisition typically consisted of a large file stored on a CompactFlash (CF) card at the site, then downloaded to desktop computers for extensive analysis. They conserved memory by storing data only when certain thresholds of beam shear were exceeded. The project team was very satisfied with the performance and reliability provided by the CR5000 dataloggers and related software products.